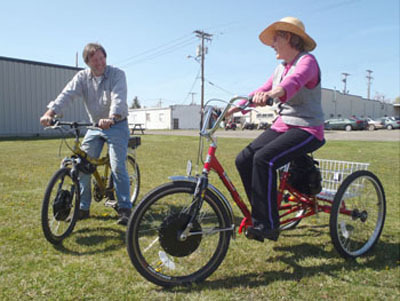 Since 1973 we’ve made and sold electric kits for customers cycles so they can run errands, ride to work, go shopping or enjoy their outdoor adventures getting only the exercise they want. These new hub motor power kits level the hills and tame the wind. They give you the choice to pedal normally, use power or pedal with power on. 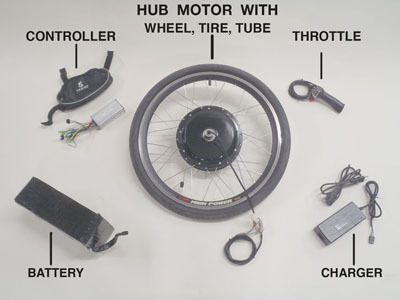 How simple to electrify your cycle? . . . . . .
Just take off the front wheel, put on new wheel with 500 Watt motor built in. Then attach controller and battery to bike. Attach the wiring that is included with the kit and put twist grip throttle on your handle bar. Now you are ready to go. Vehicle size requirement: Trike 24", Bike 24 or 26"
Warranty is 6 months on defective parts. FREE SHIPPING IN CONTINENTAL US ON COMPLETE KITS. NYS ADD SALES TAX.